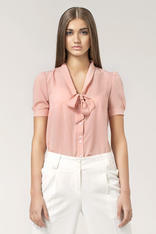 Looking for an outgoing blouse for a date or casual meetings? Or a model fit to sporty activities? Or, perhaps, you would like to look elegant and business? The collection of blouses we propose can provide you all the styles. When it comes to ornamenting, tucks, folds, frills and much more can be found here. So, place an order today.